Aiming for a win that has so far been elusive, world champion Viswanathan Anand will lock horns with an out-of-form Sergey Karjakin of Russia in the fourth round of the fifth Final Masters here. With the business end of the tournament at Bilbao still more than a week away, Anand will be hoping for a positive result against Karjakin which may help him reach closer to the top of the table before the big clash against Norwegian Magnus Carlsen in the fifth round. After the fifth game, the players will take a break and the second half of the tournament will be played at Bilbao in Spain from October 8. Things do not look too bright for Anand if the first three games are any indication. In the first round the World champion could do little against lowest ranked Francisco Vallejo Pons of Spain and drew while in the second Armenian Levon Aronian took a draw without much ado. In the third round, Anand saved a very difficult situation against tournament leader Fabino Caruana of Italy and the rest day after could really be the break the Indian needed for the tournament ahead. With seven rounds still to come, Caruana is firmly in front on seven points in the soccer-like scoring system that gives three points for a win and one for a draw. Aronian is on five points with two draws and a solitary win against Karjakin in the first round while Carlsen has lost one, won one and drawn one to be on four points for his third place. Anand, on three points, is a point ahead of Vallejo Pons and two clear of Karjakin but the non-presence of a win has caused some damage to him in the points table. What one needs in Soccer scoring system is some wins. So even though under classical system Anand and Carlsen are on equal footing (1.5 points each), the Norwegian world number one is ahead on points thanks to the one victory he scored over Vallejo. In the unofficial live rankings, Anand remains on seventh spot but the big news is Caruana who has overtaken the world champion for the first time ever and is currently number five in the world after his exploits here. The Italian looks set to be a part of the 2800 club the way he is going. Carlsen came up with a rare blunder to go down to Caruana but since then has recovered. He was seen pushing for a win against Karjakin too in the previous round and his ability to win games at will makes him a feared competitor always. The distance between him and Caruana is three points as of now but a couple of good results can pull him back to top. Aronian is the other player in fine contention and has shown excellent form. 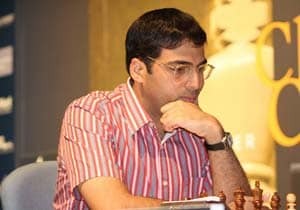 The Armenian crushed Karjakin in the opener and followed that up with an easy draw with Anand. In the third round however, he could not quite push Vallejo out of contention and drew.